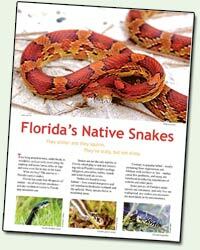 Most Florida snakes are harmless and can be beneficial to the environment. The following six snakes: eastern coral snake, the southern copperhead, the cottonmouth, the eastern diamondback rattlesnake, the timber rattlesnake, and the dusky pygmy rattlesnake are the only venomous snakes out of the 44 Florida snake species. Even the venomous species are not particularly dangerous unless stepped on or otherwise provoked. Killing a snake should be your last resort. Immediate snake capture & removal, including venomous snakes. Immediate snake capture and removal is just that. And we offer IMMEDIATE response for a snake that needs to be removed from a yard, property, commercial building or within the living quarters. Snake removal is done in the safest, most humane manner possible. Property inspections are done in a very detailed fashion. The entire property will be inspected, i.e. all flower beds, flower pots, screened lanais, yards, commercial parking lots / land, and building / structure for nesting areas & possible entry points. Trapping & removal services consist of just that. If upon inspection it is noted that there could be or there was a sighting of snakes present but could not be found / captured immediately we will then set out snake-traps to catch them and then return to remove them & rid the property of the snakes. Monthly prevention for snake control is like having pest control, but for snakes. We use a safe “pet-friendly” product that deters the snakes away from your property. Great for residential & commercial buildings / structures that have continued activity due to environmental surroundings that can not be controlled. The sealing of a structure against snakes is very important, thus not allowing the snake entry into a “warm” suitable habitat. Snakes need very little space to gain access. We will do a complete exterior inspection of the property, identify all possible entry points from the roof level to the ground and then seal the structure against entry.